In order to watch your favorite video on any portable device, you need to first convert them to the supported file format. But in case you are not aware of the process, fret not since Aimersoft Video Converter Ultimate can help you out with ease and elegance. The multimedia software for Windows enables you to convert several audio and video files to the format of your choice as it supports a wide array of input and output sources. This video conversion application allows you to trim your movies as well as capture any part of it as per your requirement. You can simply use its slider and define the start and end time, and the rest will be taken care of by the program itself. The feature is basically intended to delete redundant advertisements and black bars. As a combination of video converter, DVD burner, and DVD ripper, Aimersoft Video Converter Ultimate for Windows offers you an all-round media solution to rip and burn DVD and convert movies to the most common video formats. In addition, this editor & converter also comes with various editing functions such as cropping, trimming, merging, splitting, etc. Aimersoft Video Converter Ultimate’s full version allows you to preview videos in a built-in media player and capture frames. Apart from this, you can also make adjustments, apply watermarks as well as load subtitles. Download Aimersoft Video Converter Ultimate today to convert your videos to a number of audio and video formats. > Supported video formats: AVI, WMV, MPEG, RM, RMVB, MOV, etc. 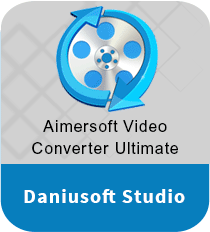 Aimersoft Video Converter Ultimate is a complete software solution for all your media conversion requirements. Before burning your videos to the CDs or DVDs, the program lets you enhance the visual quality as well as enables you to add subtitles and watermarks to the clips. Furthermore, this media converter for PC also features some basic editing tools to cut, split, and merge video files. Besides, you can also save screenshots without any hassle. On top of that, it comes with a very user-friendly interface and is able to handle multiple items at once. It is one of the best video converters that take reasonable time to complete the process while using moderate-to-high amount of system resources.